This column has RadMultiColumnComboBoxElement as an editor. It covers the features that the RadMultiColumnComboBox control has. The following example demonstrates how to manually generate columns for RadGridView in the dropdown and then make the dropdown autosize itself according to the width of the RadGridView columns. Please note that we have a 'dirty' flag, because the editors in RadGridView are reused. If we do not have such a flag, new OrderID and Quantity columns will be added each time a RadMultiColumnComboBoxElement editor is opened. FilterMode: has two values DisplayMember and ValueMember, and as the name of the property speaks this setting will determine whether the column will be filtered according to the DisplayMember or the ValueMember. DisplayMemberSort: this property will determine whether the column will be sorted by the column's DisplayMember or ValueMember. 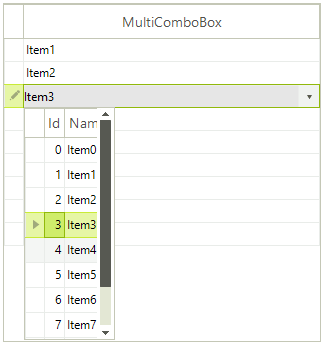 Setting it to true will sort by DisplayMember, otherwise the sorting will be executed according to the ValueMember.